The situation as it currently stands was obviously not inevitable. 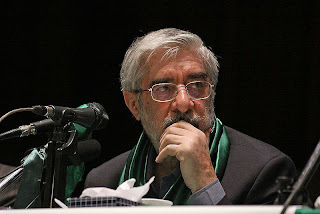 Mousavi could have decided not to risk his family's life in challenging the election; the Guardian Council could have decided that rigging the election was not worth the (probably) minor policy changes that would occur under Mousavi (this is assuming Mousavi would be winning on his own, which is still worth debating, despite obvious rigging). But rig they did, and caught they got. In the past day I've talked to some folks smarter than myself (most notably my friend Clint), and our conversations revealed some tremendous insight. There was one major mistake along the way that could have been avoided completely, and it has put all parties in the situation in difficult corners: Ayatollah Khameini, rather than waiting the traditional (and possibly legal?) 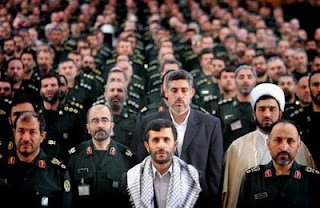 3 days to announce the winner of the election, the Supreme Leader chose a mere hour after the election to announce the "divine victory" of Ahmedinejad. Why? If we assume that the election was rigged, and that the Supreme Leader was involved, then he has a very strong incentive (and probably a bit of worry) to make the elections seem as legitimate as possible. So when Mousavi declared victory (claiming, even that he had a leak from the election commission), Khameini did everything he could to try and crush from the outset any momentum Mousavi may have gained, in an attempt to stop what's happening now from ever happening. This was an error for two reasons. First, it was so very odd that it could not be seen as anything but calculated. Never before has the Ayatollah called an election before 3 days have passed, and calling it in a mere hour is obviously a strategic move. Such suggests that something is amiss (in this case, it bolstered the already-significant evidence that the election was rigged from the top). But more importantly, it put the Supreme Leader firmly in the Ahmedinejad camp, giving him very little room to maneuver, and very few good exits if things didn't go smoothly. And then they didn't go smoothly. 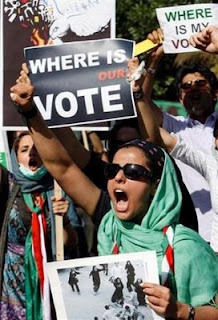 Now, Mousavi and his gang of youngsters are standing up and demanding the vote be annulled. Obviously if Khameini annulled the vote after praising it, he would have serious legitimacy problems himself. His leadership would be questioned, his impartiality would be laughed at. So he has compromised a bit--he is supporting a "recount," but insists that any serious challenges to the regime will be met by the Republican Guard. The recount is a 12-day total event, which is strategic as well: it is just long enough that he hopes to sap the protesters of some energy and momentum, and short enough that it does not make sense to stage a full-time sit-in in Freedom Square (ala Tiananmen). And many friends of mine have likened this situation to that of Tiananmen, but there are a few differences. First, it's short (Tiananmen was a month in coming before the major crackdown). Second, the youngsters/reformers have not yet taken control of the city (whereas China had lost all control of Beijing by the time the tanks had to smash in). Third, new technology (and limited control by the Iranians over it) has allowed for constantly-shifting information and communication sources, proxies, etc, that are evading government attempts to shut it down. Finally, the protesters are actually making an ultimately much smaller, much more legitimate, and much more conceivable demand: instead of asking for Democracy from scratch, they are simply asking that the vote be counted honestly--and Mousavi is (or at least was) not a major challenger to the legitimacy of the Religious regime (though Khameini may have forced him into that camp, and Mousavi has taken advantage of it: rather than appealing to Khameini, he appealed to the more religiously academic Guardian Council, who were the first to note the irregularities). But most importantly, the kids of Tehran are very different from the kids of China. While the Chinese regime was built on a rebellion, Confucian culture had, for thousands of years, emphasized the importance of the relationship between leader and subordinate. It is ingrained in Chinese culture, even today--the Cultural Revolution was a very strange departure from that, and it was one that the Chinese very firmly put behind them as soon as it was over. Rebellion was a bit strange and foreign to many of the Tiananmen youngsters, and when they got shot at, they scattered. 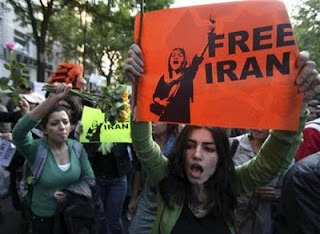 But it will not be so easy for the Iranian regime. Already, the volunteer Basij (a pro-government milita) stormed the university that many protesters were camped in, smashing, looting, and beating. 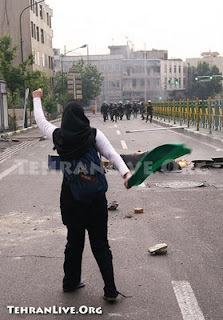 Basij has shot and killed 8 protesters, and wounded 28 more. There have been street clashes with rocks, batons, fire. 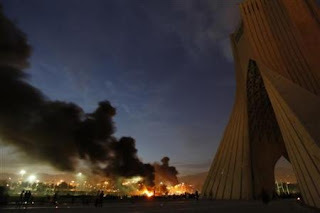 The protesters have already set fire to a Revolutionary Guard building that the Basij worked out of. These are unlikely the makings of a successful violent revolution, but it is clear that the protesters are not afraid of violent conflict. And so we look to Iran's history for the explanation of such an embrace. Shia Islam was built, thousands of years ago, on rebellion. It was a proclaimation that the Sunni Caliphate was illegitimate, and that disobedience of evil leadership was a virtue. The Shiites were (in the past) the primary terrorists/assassins of Islam, and the Iranian Revolution was a predictable (rather than strange) consequence of the CIA-installed Shah. Since then, Iran has proudly indoctrinated its children with this rebellious spirit--it's why Iran's domestic politics allow its foreign policy to be so rogue and confrontational in nature. In the war against Iraq, millions of youngsters donned red bandanas and literally ran across open desert, unarmed, at machine gun emplacements and tanks, howling like banshees, climbing over their dead brethren, in order to either join the Martyrs or rip the Iraqis apart with their own hands. They suffered immense casualties, but their will never broke. This is the legacy that these kids inherit. And now, Iran's most dangerous weapon to any outsider has now been turned, in part, on the regime. These kids will accept conflict, violence, and casualties, and they are not afraid to inflict them. 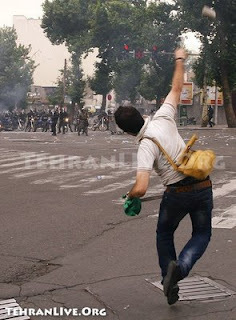 Trying to break up the millions of Tehran protesters will be a whole heck of a lot harder than breaking up Tiananmen. And it will turn a huge chunk of the country (even tentative supporters of Ahmedinejad) against the regime for a very long time, should it happen. It would seal that the regime rules by force, terror, and authoritarianism, rather than by the will of its people. Such an outcome would be disastrous, even if the protesters went home. So Khameini must find some way to end this. If he does not, he is doomed. But he is in a very difficult position, and that makes him incredibly dangerous: he cannot simply call Mousavi the winner. He would undermine his own authority and anger a different very large chunk of the population in a similar way. The recount still has the potential to lead to another vote--either that, or it will simply erode Ahmedinejad's lead and declare him the winner anyway. Both moves are difficult. 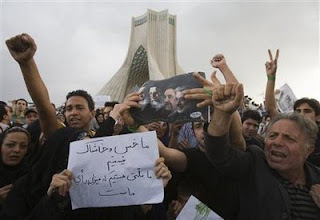 But I do not believe that telling the protesters, "recount done, Ahmedinejad won, go home," is likely to work. Any exit now is going to be bad for the regime, but perhaps, the least bad way is to rig the "recount" such that there is a second vote, and let Mousavi squeak by with a victory. If Khameini is foolish (and he rarely is), he will seek some exit where he takes almost no political flak. This would make him the most dangerous of all, as he would do something neither I nor my friends have yet predicted. 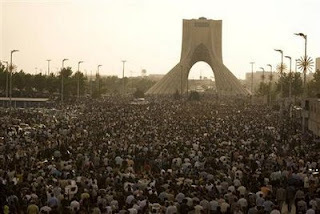 But tomorrow, millions (likely) will assemble in Freedom Square, once again defying Khameini's decree, to mourn the dead protesters with Mousavi leading the entire gang. While foreign journalists are not prestent, Twitter and Facebook still are, and their ever-watching eye will make this public. Mousavi is putting the regime in a difficult place: let him stand up defiantly and do as he pleases, or brutally force him out and kill dozens, hundreds, or even thousands of Iran's finest youngsters? Both options are terrible. Tomorrow will be a dangerous day, and Mousavi knows this. Many of his supporters know this. Even if they manage to kill Mousavi, there are others. Kharoubi is an excellent second choice for the reformers, and even more liberal than Mousavi. He could take the helm, with a newfound fury from the reformers. But Khameini is clever, despite his recent mistakes. And the Guardian Council's support of the recount means he is under a lot of pressure to not simply try and crush this defiance. I am not sure what he will do in the long term. Tomorrow, he is likely to send the police to try to keep the protesters off-balance, but is unlikely to authorize deadly force. Unfortunately, this is likely to have little effect. All we can do from here is watch and hope, and see what he will do. I leave you with some of the more compelling pictures of the conflict so far. Fire-barricades to Ward Off Police. Recent demonstration in Freedom Square. 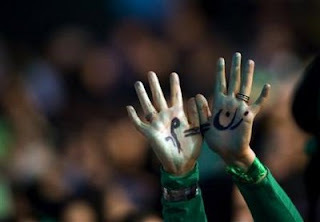 A Woman with "Man = Woman" in Farsi on her Hands. 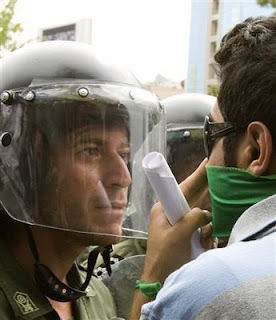 A Riot Police Officer Confronts a Protester (Peacefully). 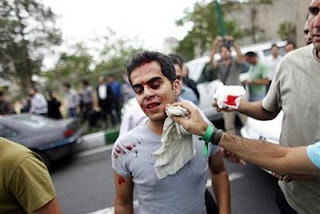 A Man Shot or Beaten by Basij or Police. Riot Police Chase and Beat a Protester. The Guardian Council announced today that they would be recounting "Contested" districts, but that Iranian constitutional law does not allow them to annul the vote. This is entirely possibly true, and I really have little enough interest in studying Iranian Constitutional Law to figure this out. Either way, it won't be annulled, which leaves a few options from here. 1) Recount supports status quo. If the Guardian Council wants Ahmedinejad to win, and only really cares about dampening the blow of stealing the election, then they will close the gap a bit, admit some mistakes, but let him squeak by. This, I think, is the most likely outcome. 2) Recount leads to re-vote. If the recount puts Ahmedinejad under 50% and nobody over 50%, then he and Mousavi will face off in a re-vote. The Guardian Council here would have to be either seriously dedicated to honesty or seriously terrified of unrest to go this path. It is possible this will happen if they recount (by which I mean, "accurately report in") enough districts, especially urban areas. 3) Recount leads to Mousavi victory. This is pretty unlikely. One of Mousavi's big complaints was that his districts had problems of intimidation, extortion, and woeful under-balloting--the Guardian Council is ignoring all of these problems by ordering a recount, and not an annulment. Such an outcome would also be pretty obviously admitting massive fraud, rather than just a bunch of mistakes/irregularities, and the Guardian Council would very much like to avoid that. Even if they decide Mousavi should win, they're going to send it to another vote to do that. If option 1 is chosen, the options for the Mousavi crowd are acquiescence or revolution--the latter being particularly tough given the brutal, fanatical, and gun-toting nature of the Revolutionary Guard (and the "progressive" curtailment of citizens owning weapons in Iran). But they can make enough trouble to seriously cripple the administration in the eyes of the West and even much of the Arab world, but they're going to need to do a lot of dying to do so. If option 2 is chosen, there is some hope, but Iran continues to block phone service, pro-Mousavi websites, etc, and continues to jail reformist politicians. Organization will be difficult, but it can be guaranteed that anyone that stayed home in the last vote will come out this time as part of the Green Revolution. This is the option where the Guardian Council gets to gain (rather than burn) some popularity by appearing to save the country from some corrupt lower bureaucrats, or something similar. But, now all one can do is sit back and wait. The US' decision not to publicly denounce the election may be working in their favor--Iran is making a big fuss over the EU having done it, and if there's anything that can kick up Ahmedinejad support, it's the US or Israel appearing to try and interfere with Iranian politics. I give the Clinton/Obama crowd a lot of credit for that level of discretion and wisdom. A surprisingly good Time article outlines why one should be "suspicious" of Iran's election. 1) Consistent results across districts. This is highly unlikely actually true, given that Mousavi polled much better in cities (with what little polling there was), and Ahmedinejad better in rural areas. The demographics and voter issues are very different. Consistency across districts likely means someone pulled some numbers out of the air and threw them down. 2) Ahmedinejad won in every major city. Also unlikely. Some cities are particularly wealthy, young, educated, and were all but painted green the week before the election. 3) Ahmedinejad beat Mousavi in his own home town. This is just absurd. Mousavi was almost certainly most popular in his own district, and it is simply unbelievable that he could not win it. 4) Karoubi got less than 1% of the vote. This would suggest that many of Karoubi's personal campaign volunteers bailed on him at the polls. The fact that Ahmedinejad beat Mousavi by approximately the same margin in every district, city or rural, and in Mousavi's home town are so statistically improbable that those that care about empirics cannot accept it. This election was rigged; I am officially calling it fraud. Frankly, this is bad election rigging. Ahmedinejad had a serious popularity base, and as a friend said, "he could have gotten over 50% of the vote if the Ministry had bothered to count the votes." And, frankly, it is surprising that these results are so poorly rigged. As another friend said, "I could do better than this with the 2005 results and a python shell." But with such blatantly rigged results, why is the US not standing up and calling it rigged? Perhaps Obama/Clinton fear that overt attacks on the election could harden the shell of the conservatives in power of the Guardian Council, or otherwise provide firepower/motivation against a new election. The EU is being more overt about it, perhaps because they are not as hot a topic as the US, or perhaps because they tend to follow a bit of a more friendly-idealistic foreign policy. Who knows. But the clearly-rigged nature of this election gives more credibility to the allegedly-leaked results (although Ahmedinejad getting third seems unlikely, too, given how much noise his own supporters made). Unfortunately, the Council will struggle to be able to say, "oh, wow, hey, we found the real results!" and just publish them--it would be an admitting of systematic, centralized fraud and fakery. More likely, if they capitulate, they will find a few folks in the Interior Ministry they don't like, sack/imprison/kill them, and say that there were "sufficient irregularities" to require a second election, push it through, and only then give Mousavi the win. But, we can certainly hope for that. Iran's post-election situation seemed rather bleak for the pro-reformers (and for the West) after the election commission announced Ahmedinejad's landslide victory. But I am getting some conflicting reports on the situation, so bear with me, but I will try to summarize and analyze as best as I can. After the election, Mousavi and Ahmedinejad both claimed victory. The state media then announced that Ahmedinejad had achieved a pretty stunning 62% of the vote, which is a number that really nobody in the West can seriously claim is or is not a good estimate of his actual support. Mousavi called foul, claiming that members of the election commission told him that he had a serious lead (around 58%) when the polls closed (which he claims had led to his claiming victory). After crying foul, Mousavi's supporters took to the streets, in defiance of Khameini's decree, and began protesting (which, of course, turned intio rioting with busses burning, shops breaking, etc). Obviously, there have been lots of clashes between protesters and police. Sometimes, protesters were broken up--sometimes, the police ran. Lots of people have been beaten up, arrested, probably killed. Iran arrested Mousavi and put him under house arrest at some point, though he is clearly out now. Other reformists were also arrested, as was the Supreme Leader's daughter, who has at least sympathized with Mousavi's cause. I'm not sure what her status is, currently. Iran cut off cell phone service to Tehran, and packed it with police. It has also tried to shut down all pro-Mousavi websites, but its Internet censorship team is not anything on part with China's, and they are largely failing to keep the ever-morphing mass of information from jumping around between different websites, twitter accounts, and whatnot. People are staying informed, and organized. If these numbers are true, they have incredible implications. First, the run-off vote would be between two reformers (with Mousavi the clear favorite), basically sealing a big victory (and relief) for the West in Iran. Second, Ahmedinejad's policies are so woefully unpopular that he would have the worst incumbent turnout in any presidential election I can even conceive of. Third, and finally: massive, systemic, planned fraud from the very top was designed to make sure this election went one way. If these numbers are true, then Khameini deeply feared the results, and with good reason. Such overwhelming (almost 80%) support for reformist candidates would put great pressure on him, and great support behind the President. He does indeed answer to a series of religious elites in Iran, and many of them actually care about Iran and its people (who knew!). And the pressure from the electorate to void these results is starting to trickle into such elite circles. A group of influential Ayatollahs have called for the election results to be nullified, and the election to be re-taken in order to win the confidence of the Iranian people. I have heard scattered reports that there are election commission officials calling for a re-vote with better controls of irregularities. The West is finally coming out and making calls for investigations, although cautiously. Today, Mousavi (somehow getting out of house arrest?) appeared in Tehran in front of (what an Iranian police officer said was) 1.5-2 million supporters, in defiance of the Supreme Leader and under explicit threat of deadly force. He has whipped Tehran into a fervor, and is trying to keep the energy up in order to keep the pressure on the leadership high. He has the momentum, and he knows it. At this point, the Supreme Leader needs to seriously worry about losing control of Tehran and having to resort to an incredible massacre with the Revolutionary Guard. In order to try to assuage anger, he is actually calling for investigations into the "irregularities" cited by Mousavi. This could be one of two things: first, he could actually be balking to pressure, and plans to call a new vote (it is unlikely he will flat-out declare Mousavi the winner). Second, and perhaps more likely, he will probably stretch out the investigation in the hopes that the energy of Tehranians will fizzle, and then declare that despite some irregularities, Ahmedinejad still won. The second path is dangerous--these youngsters are largely on summer vacation, and they don't actually have normal lives to return to in the next two months. 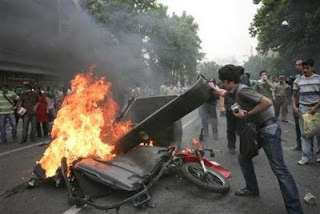 Mousavi has almost nothing to lose, as he'll surely be thrown in jail of Ahmedinejad walks out of this with the win. That said, all these kids can threaten to do is give Iran an ever-increasing public relations scandal, and undermine Ahmedinejad's authority abroad. But will he care? Will the Supreme Leader? That is a question with bleaker possibilities. But, frankly, there is hope. Mousavi and his band of youngsters have not only shaken up Iranian politics, they have changed the face of Iran to the West forever. Even if Ahmedinejad emerges with the presidency, the West shall always look to Iran's people with great sympathy, as their fight for liberty tugs our heartstrings. They share many of our values. They remind us of the best of ourselves. That, alone, may change the West's relationship with Iran--or at least its policy towards it. But, further, there is a chance that the Supreme Leader will decide that the safe route is a route of lower risk--one that does not involve such obvious lies and deception, but one that bends to the will of Iran's citizens, and allows Mousavi the chance to do what he can. Iran's religious leadership has weathered reformers before, and while Mousavi promises to be quite effective, it will weather them again: Khameini has very little to lose by sweeping in and playing hero to the Iranian people by using his hand to call a new vote and hand Mousavi the victory. In fact, he may decide that this moment in his legacy is one where he does, indeed, want to play the hero, rather than the villain. Ahmadinejad apparently got 62% of the vote, giving him the win outright. Frankly, I wouldn't be surprised if that was nearly true. But Mousavi is calling foul, alleging vote-rigging, intimidation, etc. The US has yet to make an announcement on the issue. In response, Mousavi supporters have taken to the streets in Tehran. Buses are being burned, shops broken, etc. 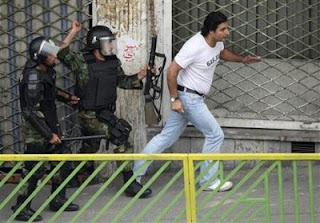 Tehran needs to avoid a total crackdown, but the Revolutionary Guard has promised to deal decisively with the problem. Additionally, cell phone services are currently suspended in the Tehran area, and websites related to Mousavi have been blocked. The chance that this will turn into a full-fledged revolution is quite low, and without such a push, the protests are unlikely to go far. They may damage the regime internationally--or at least with the West--if their fury can provoke Western nations into condemning the outcome. But such condemnations are likely to drive Iran's policymakers deeper into partisanship. According to Twitter's @BreakingNews, preliminary official results give Ahmadinejad a whopping 70% of the vote (to Mousavi's 28%). Tough to believe, but either the people or the dictatorial religious leadership of Iran wanted to make sure he won, and it doesn't really matter which group made that decision. I was really looking forward to not having to remember how to write "Ahmadinejad." Now both sides are claiming victory. We're going to wait for numbers here at Foggofwar. Mir Mousavi, the longshot challenger to Ahmadinejad in the Iranian presidential race, may have just won in the first round. The election took place today, after weeks of very heavy street campaigning, with a party-like atmosphere. Mousavi was the leading reformist candidate, and started (seemingly) picking up support late in the campaign. Most Iranian elections go to two rounds (the first round being a free-for-all, the second being a run-off between the top 2 candidates if neither receives 50% of the vote); getting more than 50% in the first round would be unprecedented, especially in a race that went from Ahmadinejad-edged to very close only in the last few weeks. But today, large numbers of middle class, youth, and women packed the polls, in an election that is expected to have a greater than 80% turnout. 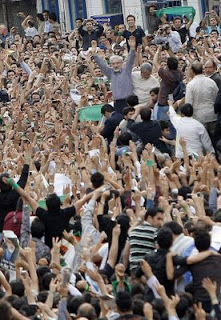 Ahmadinejad's supporters tended to be more poor and rural. A Mousavi victory would have significant implications for US and Iranian policy. He supports economic liberalization, detente with the West, and social reform. He is said to even have the political clout/connections to be able to stand up to and influence the religious leadership (a often-cited failing of the last reformist President that Iran had). It would give the US and Iran an at-least-4-year opportunity to start patching relations, and potentially work together to influence policy in the Middle East. More coming on the actual poll numbers as they arrive. A lot of people have been asking for an analysis on North Korea. From what I've been reading, there's a lot of half-hearted attempts to explain Kim's behavior as a strategic brinksmanship to try to extract concessions from the West. But this essentially hasn't worked for years, unless you count the South Korean "sunshine policy," which has been criticized as appearing to be in response to North Korean aggression. But this current flurry of missiles is obviously not going to lead to more money in NK's wallet, and Kim should know that. Some have said that he's just flying off the handle. My first thought is: wrong tense. He flew off the handle years ago. It's unlikely he has gone significantly more crazy than before. And further, he is not actually all-powerful, especially in the inner military circles. He must manage a group of influential military oligarchs that spend a great deal of time creating personally-loyal cadres of crack troops. And he's doing a fine job, but he wouldn't be testing nukes and firing missiles without them. Which brings me to my hypothesis: The very ideological/conservative factions of the military are probably twisting Kim's arm: he wants his son to take over, and needs their support. They probably want to test the international waters, as it were: how will the world respond? If North Korea can make a push to arm itself with nuclear weapons and ICBMs (though combining the two of this is much more difficult than it might seem at first--nukes are heavy and complicated), then it can not only plausibly threaten massive destruction of Seoul, but of Tokyo, and eventually Los Angeles. And if that's the case, then North Korea becomes pretty free to do a whole lot of things it would like to do--possibly including invading South Korea. 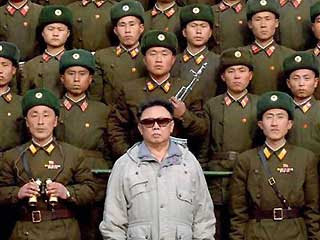 Already, it's clear that North Korea likes to take risks, doesn't care about world opinion, etc. But if they had a nuclear deterrent, they'd be pretty terrifying--because they would be willing to put up with far more domestic casualties than approximately anyone else on earth, any military operation against them would be potentially disastrous. 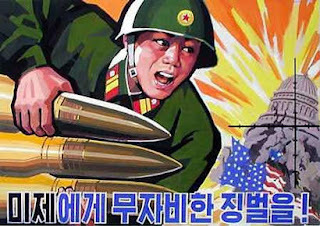 And so, with Kim's arm possibly twisted, the hardliners in the military may simply be trying to rush through their testing and keep the world off-balance with threats of war with South Korea as they do so, so that they come out of this "crisis" much better prepared for the real crisis that at least some hardliners are surely planning. Perhaps I am a bit optimistic in the power of Diplomacy. As a number of readers have pointed out to me, Mr. Obama has not changed a whole lot of US Foreign Policy. Pick a foreign policy situation, and Bush/McCain would have probably done whatever Obama's doing now (save perhaps Guantanamo, which is questionably foreign policy, and questionably changing at all). Obama's "humble" Diplomacy has many in the GOP grumbling, but it's really a great way to get everyone to like you without actually having to do any work. Anyway. A few elections have come and gone, with some pretty pro-American results. Not every election puts most of its weight behind an American referendum, but US & Allied policy has been a pretty hot topic as of late. The EU elected pro-market, pro-US centre-right parties to its parliament despite rough economics and formerly-shaky US-EU relations. More importantly, Lebanon's pro-Western coalition held on despite a concerted and blistering push by a pro-Iranian (Hezbollah-led) coalition to get a majority in parliament. Many analysts are venturing that President Obama's speech on Islam may have made a difference, and indeed it may have. And, as soon as the speech was over, many political leaders said that they wanted action beyond the words, but in any democracy, words can go a long way in a voting population. Mr. Obama's speech to the Muslim world was timed in particular to be right before the Lebanese and Iranian elections--two of the most important elections in the Middle East in the next few years. Even Iran's opposition may have gotten a bit of a boost (albeit perhaps futile) from Obama's speech. Ultimately, it is easier to find a way to get along with an adverasary than to fight them. Particularly, when the adversary is the US and its Allies, finding some common ground and a leader that will reach out to them often reduces difficulty on your own part. Such was the basis of the "thaw" in the US-Soviet Cold War. Such may be the basis of a changing attitude toward the US in the Middle East in in the EU--if the US appears more willing to talk and work together, then the EU and Middle East will gladly accept the stance and jump at the opportunity. Such speeches and diplomatic blitzes may prove very useful to the US, and are likely to prevent the "marginalization" of US power so quickly predicted by US and foreign pundits alike. Mr. Obama is taking a page from Sarkozy's diplomatic book, and may already be turning key results in favor of the US' long-term foreign policy goals. The EU had its elections today, and for whatever reason, the centre-lefts got pretty hammered by the centre-rights and the Liberals (these being real liberals [in favor of small government and civil liberties], not what the American leftists have tried to call themselves). The yellows are the liberals and the light blues are the liberal-conservatives. The red leftists got pretty hammered. We're still to who ends up actually getting on board with the winning coalition, and what the new policies will be, but expect: more free trade, slightly more pro-American bend, lower taxes, and probably some less regulation.